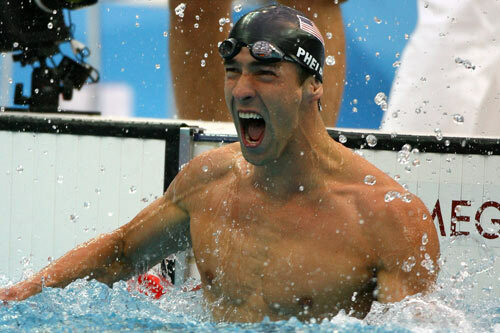 How many little boys in the world are saying right now, “I want to be like Michael Phelps!”? And for the first time in awhile, parents, grandparents, aunts and uncles can pat that little boy on the back and say, “You go for it!” Phelps is a fantastic role model for our youth. I’ve really been enjoying the Olympics this year. Perhaps it’s because I didn’t really watch the Atlanta games from Japan. After my long days at the computer, writing my newsletters (almost done! ), polishing my resume and researching jobs prospects, I shut the computer down at 8pm and treat myself to an evening in China, becoming an enthusiastic spectator at any of the competitions shown on TV. When the United States won the Men’s 4x200m Freestyle Relay, I found myself up out of my chair jumping up and down. What terrific moment in Olympic history! The US earned the gold medal, smashed the world record AND taught the French not to talk smack! Ha! It was SUCH an exciting race! After that specific win, the NBC reporter (What is that blonde woman’s name who asks all the dumb questions? ), kept trying to get Michael Phelps to respond to the comment made by the French. But he wouldn’t. He remained diplomatic. Even before French anchor man Bernard got out of the pool, Phelps was there to pat him on the head and shake his hand. A great show of sportsmanship. I’m totally cheering for Michael Phelps to get all the gold medals he deserves. What a stand-up young man and a great guy for our little ones to admire. Go Michael!